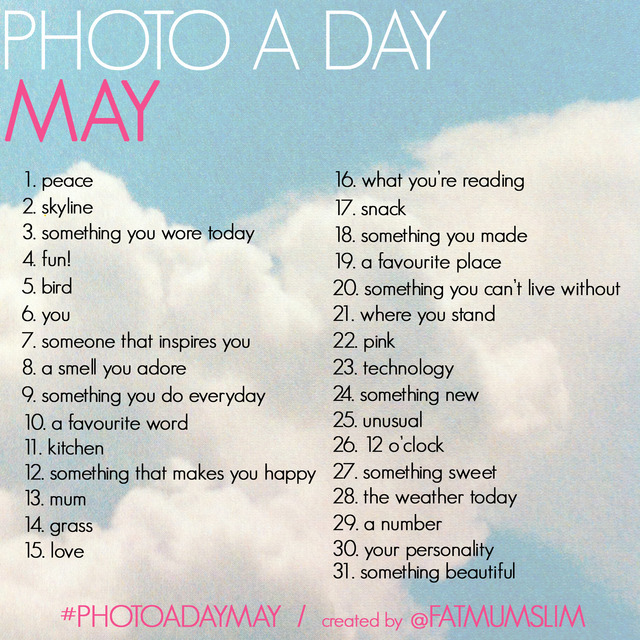 Yesterday I happened upon a tweet talking about Photo a Day May. I clicked through and learned it was a photo challenge created by Fat Mum Slim in Australia, where you take/post one photo each day that corresponds with a theme (the list is below). I haven't ever done one of these progressive photo things (with the exception of a failed attempt at Project 365), so I thought this would be a great opportunity (and keep me committed since you all will be here to hold me accountable!). The theme for today, May 1, is "peace," and it just so happens I took a photo that represents this (to me at least) several weeks ago. The hubs and I were driving along the river up near Alton, Ill., the sun was setting and there were hardly any other cars on the road. It felt like we were back on the PCH in California (although there would need to be a lot more cars for that), but it also reminded me of how, in college, I would take long drives along the country roads whenever I needed a break from life. Despite all the twists and turns (and probably driving too fast on some of them), I got such peace from setting aside an hour of my life, turning off my cell phone and cruising with the windows down, listening to music that mimicked whatever I was feeling at that moment. Love your shot.. Very amazing scenery.. ;)) I take part in the challenges, and found ya per web.. Stopping in to say hello.. ;)) Marilyn - via http://www.theartsygirlconnection.com ..Happy Hump Day..